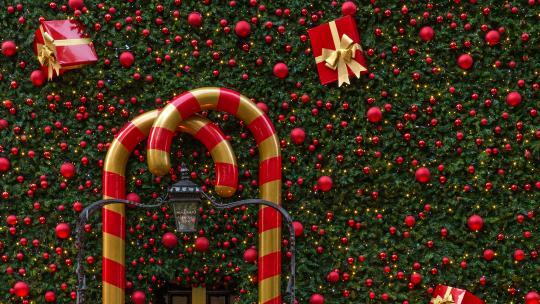 We love a good Christmas tree and they're popping up across London in all their twinkling, festive, fragrant glory – who's done it best this year? Oh Christmas tree, oh Christmas tree, how lovely are thy… silver branches? Forget lacklustre tinsel and boring baubles - this year it's all about glass hearts, oversized presents and animatronic robots. 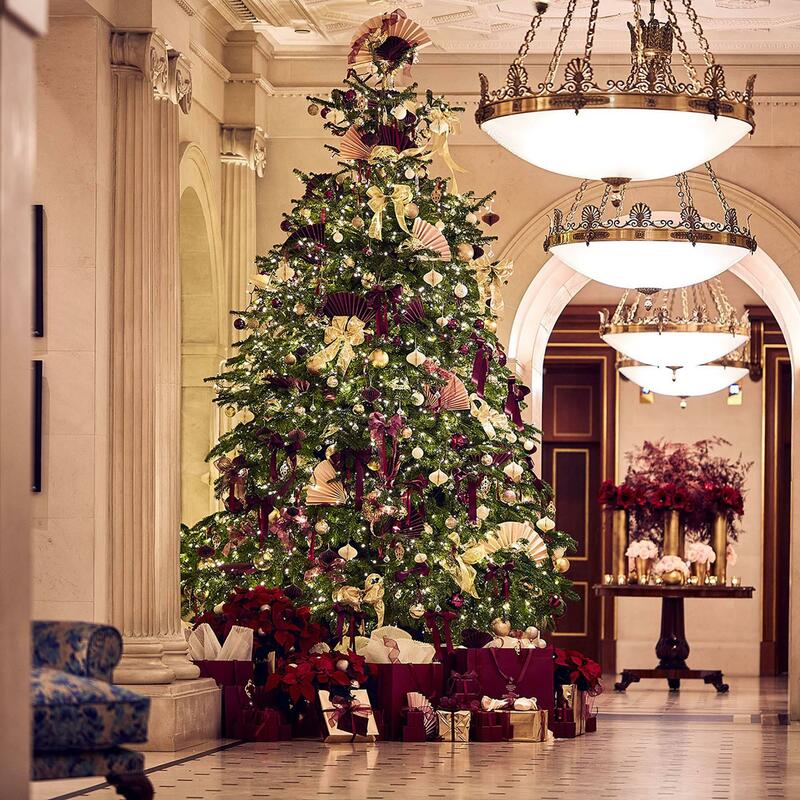 London’s top hotels and international brands seem to be playing a friendly game of seasonal one-upmanship when it comes to festive firs. Who can go bigger, brighter and more brilliant than last year? 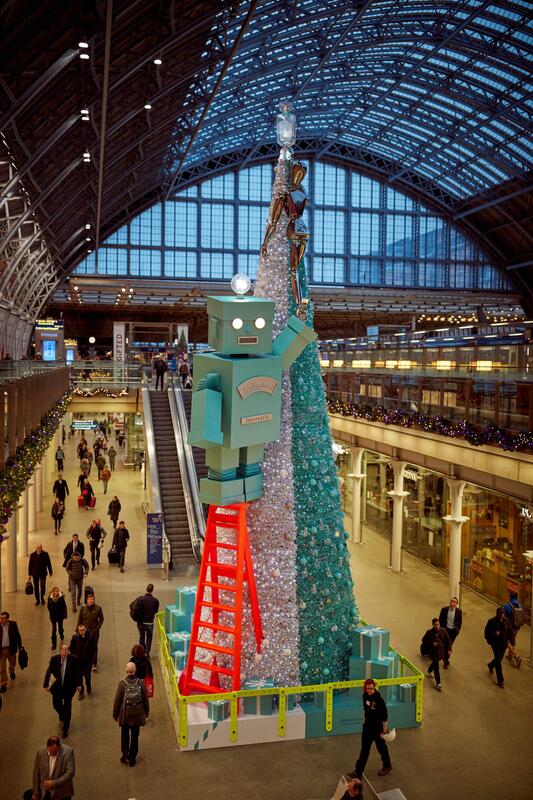 They’re all after the ultimate prize – the most Instagrammed tree in the land. Read on to find out which creations we think have the most magical of festive feel-good factors. 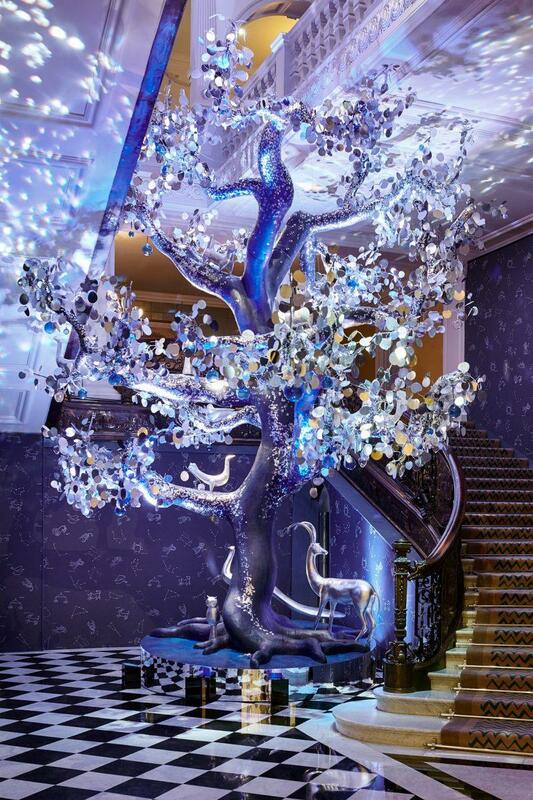 Diane von Furstenberg is the ninth “distinguished guest” invited to cast her spell over Claridge’s tree. Its 2018 spectacular is the six-metre-high Tree of Love, which “is inspired by Diane’s passion and strong belief in the power of love, symbolising life and nature, and drawing particularly from the creative influences of the ancient traditions of the astrological world”. 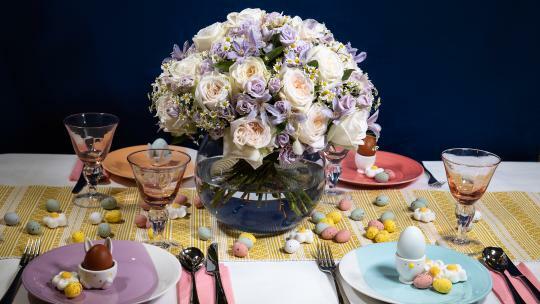 Iridescent blue glass spheres and 150 glass hearts twinkle among 8,000 shimmering, hand-painted silver leaves, and a sculptural deer, representing gentleness, sits at the base. Look out for the little silver mouse, curled up, symbolising curiosity. 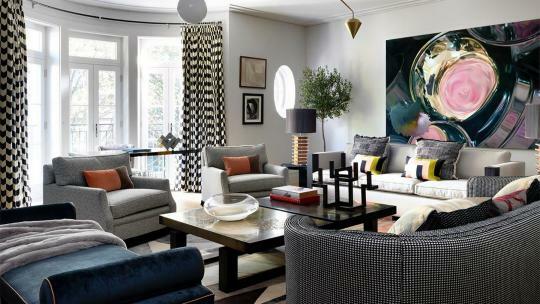 “Claridge’s is my favourite hotel in the world and my home in London,” says DVF. “The Tree of Love celebrates all aspects of love and life…. It is the symbol of strength, enlightenment and life.” The perfect sentiment for Christmas. 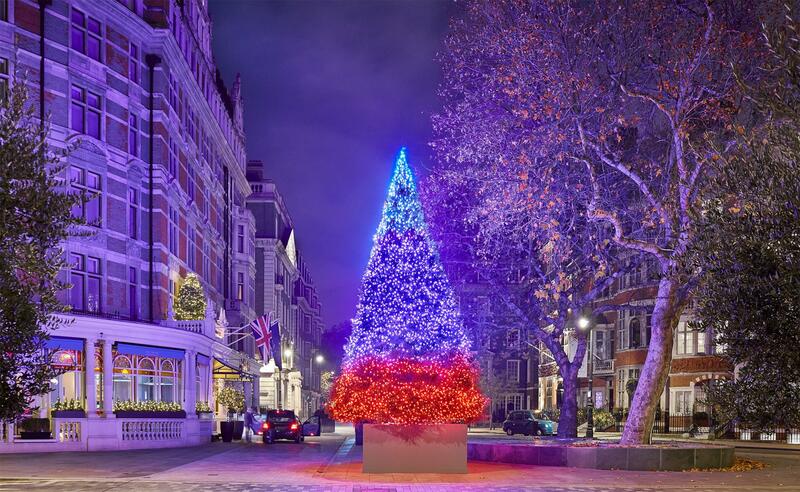 The Connaught called upon artist and Royal Academician Sir Michael Craig-Martin CBE to add his magic touch to its nine-metre-tall Norweigan Spruce this year (following in the footsteps of Damien Hirst, Antony Gormley and Tracey Emin). It occupies a prime spot beside the world-famous Tadao Ando fountain on Carlos Place. You can’t possibly miss the 12,000 light bulbs in Craig-Martin’s distinctively bright palette that “engulf” the tree – its ever-changing colours continuously glow, fade and sparkle. “It struck me that however beautiful, most Christmas trees are static, unchanging,” mused Craig Martin. “I wanted to make a tree that was dynamic.” That it is, Sir Michael, and then some! Also tripping the light fantastic is Tiffany & Co at St. Pancras International. It’s the station’s first ever tree, standing at 43 feet tall, and it's scented too, complete with 600 replica bottles of the jewellery house's Signature Eau de Parfum, 600 hand-crafted paper flowers and 600 white and silver baubles. Overseeing proceedings is a 17-foot animatronic robot made of Tiffany Blue Boxes propped atop of a ladder. At the heart of Tiffany’s festive theme this year is the holiday hero – an articulated chrome figure first seen in the legendary Gene Moore’s 1960s window displays for Tiffany. The brand's boutique below the display does everything from gift-wrapping to complimentary bottle engraving, making your commute home that bit more efficient (and fragrant). 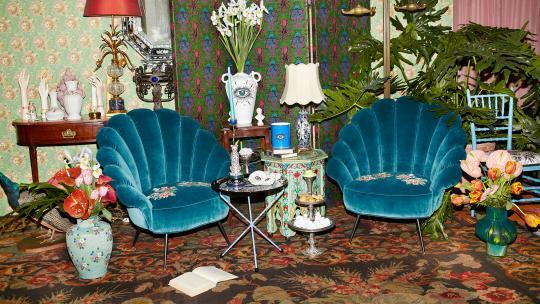 You can count on maverick foodies and experiential maestros Bompas & Parr to deliver. 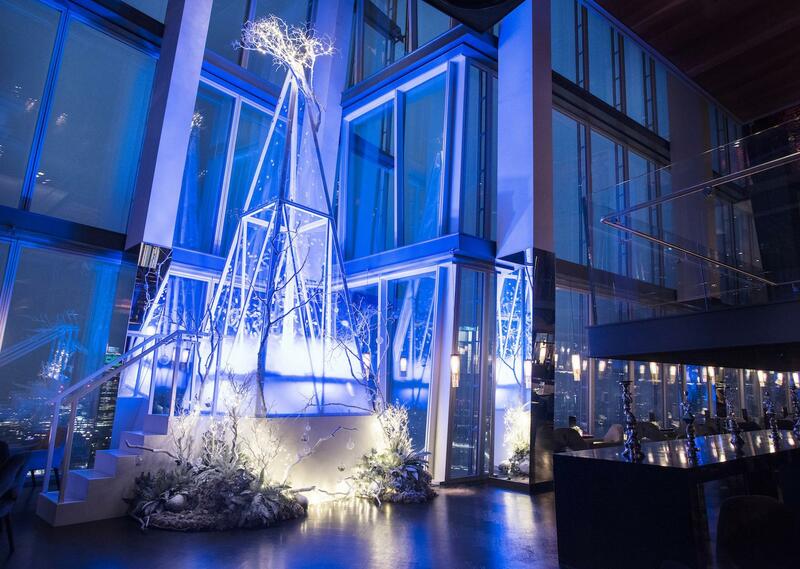 They've created Snowscape, an interactive snow globe that sits in the window of Aqua Shard, 31 floors above the capital - an angular, modern take on the traditional Christmas tree with wild, frosty branches. If you're old enough to remember the Crystal Maze - fondly - you'll love the interactive snowstorm element. Reach through a pocket cut into the tree and grab one of the golden snowflakes whirling around - during the 'Golden Hours' twice daily, Monday to Friday - and get a free rum and Becherovka liqueur cocktail, served in a snow globe, before being entered into a draw to win a meal for six. Bravo Shard - a truly futuristic Narnia vibe. You can count on the Lanesborough to be traditional enough to keep puritans happy while glamming it up enough to delight the rest of us. Fine jeweller Garrard can take credit for this decadent extravaganza, complete with regal red and blush-pink fans, draped ribbons, decorative masks and delicate crystal ornaments, such as the regal motif from the monarch’s sceptre. The design is intended to evoke Garrard's earliest years, a time when opera masquerades were the height of fashion and The Lanesborough was the country mansion of the 2nd Viscount Lanesborough. We say: practically perfect in every way. The historic Royal Exchange was founded in 1565 by merchant Sir Thomas Gresham to create a hub for commerce in The City of London. The trading market was remodelled in 2001 and is now a luxury shopping destination, housing Aspinal of London, Bremont, Boodles, Church's and London's only Halcyon Days boutique. 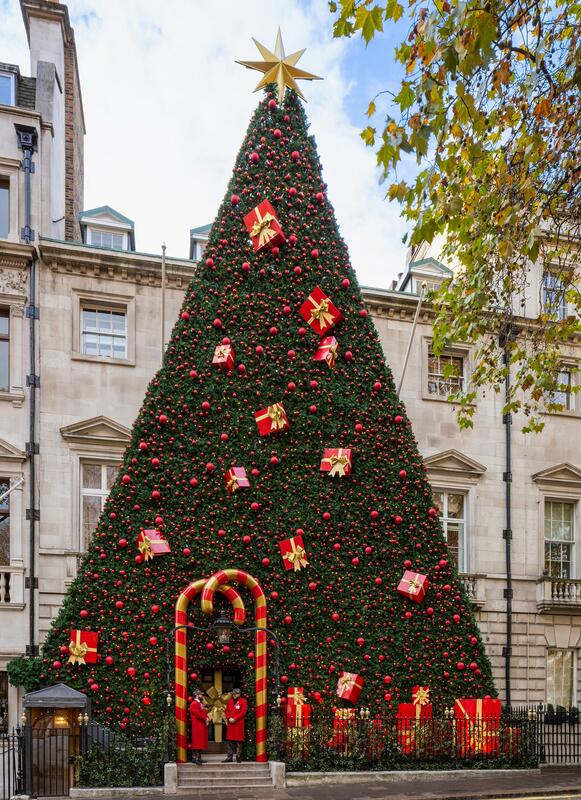 This year's Christmas tree, unveiled by Claudia Winkleman, has been created in collaboration with Fortnum & Mason. The resplendent evergreen is festooned with miniature versions of Fortnum’s famous hampers and thousands of twinkling lights. 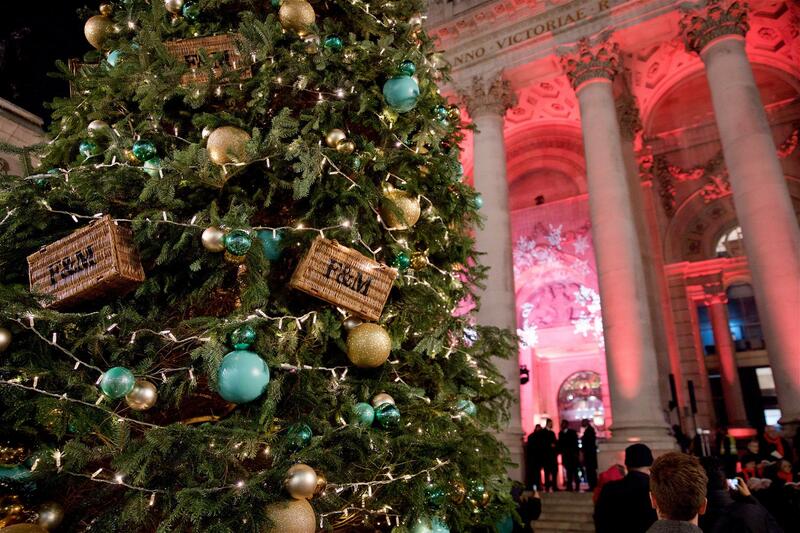 For the first time, the Royal Exchange on Saturdays throughout December. Beneath grand vaulted ceilings, shop luxury goods for men and women, and recharge at the Fortnum & Mason bar in the central courtyard. Winning no prizes for subtlety but all the prizes for the sheer magnitude of this homage to Christmas is Annabel’s. 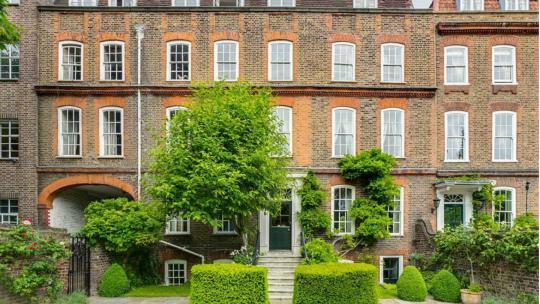 Its tree even has its own doormen. Stretching the width of the Annabel’s façade and several storeys up into the air is a (relatively) traditional tree, bedecked in red baubles and lights, with a few massive presents thrown in for good measure. 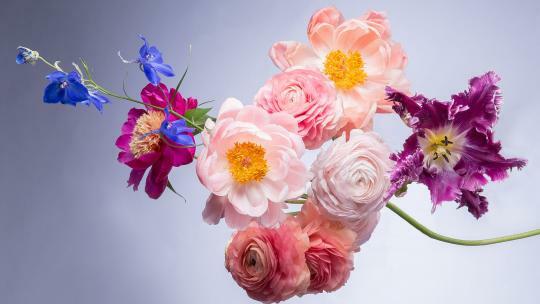 We salute you, Annabel’s – go big or go home.